Have you heard of the bike shed effect before? The bike shed story tells of a management committee’s decision to approve a nuclear power plant, which it does so with little argument or deliberation. The story contrasts this with another decision on choosing the color of the bike shed where the management gets into a nit-picking debate and expends far more time and energy than on the nuclear power plant decision. Karl Fogel, a renowned engineer on the topic describes the issue as “the amount of discussion is inversely proportional to the complexity of the topic that has been around for a long time”. The bike shed effect (also known as the bike shed problem or Parkinson’s Law of Triviality) is an issue commonly known in the corporate and consulting circles. While it takes its roots in the corporate domain, it has its parallels in personal development too. You are out shopping for a purse. You can’t, for the life of you, decide whether to get the color pink or light red, which have a color difference of a delta E value of 1 ( i.e. not even visible to begin with). You stress out over it and decide not to get either of them. You then spend the rest of the week thinking about the purse and the color that you want. You even consult your friends about it. And at the end of the week, you go all the way out and return back to the shop just to get that one purse when you could have gotten it back then when you were there. You have a dream to pursue your passion. Everyone around you gets into an outburst and starts volunteering his/her opinions even though you don’t ask for any. You reverberate in shock and decide not to pursue it under everyone’s coaxing. You decide to become a raw foodist for personal reasons. You begin to draw a lot of attention and criticisms to your lifestyle, namely from your friends, parents, colleagues, and even your doctor — even though they know nothing about the raw way of life. In each of the 3 situations above, you see the bike shed effect kicking in. Picking a color seems like such an easy decision that you’re afraid to make the wrong move. There are no frameworks, no tools, no data and no information to help you make this decision – all of which are things you normally rely on to make decisions. So you ponder to death thinking about this decision, out of fear that you will make the wrong choice and regret later. What started out as a simple decision, now becomes the hardest problem of your month. Funnily you have no problem making big business decisions or closing big transactions that are 10-20 times more expensive than the purse. Career and work, recreation and passion. These are things which everyone can relate to. These are things which everyone has pondered about at some point in their lives. These are decisions that people are living right now. So everyone feels that he/she has something to say about the matter, regardless whether they really have actual experience on said matter. Everyone eats every day — morning, afternoon, evening. So everyone feels like he/she is an expert on diet, food and nutrition, even if they may know nothing about the diet you are pursuing. Firstly, the simplest problems can take up the most of our time. Why? Because they are so simple that they boggle our minds. They also tend to rely on our subjective judgment which we lack faith in – whereas we have no problem dealing with objective analysis and decisions. Secondly, everyone and his/her grandmother can give you advice on something. The amount of unsolicited and “free” advice you get increases exponentially with the relevancy of the topic in one’s life – even if it’s just by proxy. Meaning, if you want to quit your job and set up a new business, you will get staunch and forceful advice from 20 different people who are working in day jobs. That’s because they can relate to one half of the situation – the part on what you “lose” from not having a day job. Never mind that they have never set up their own businesses before and know nothing about becoming an entrepreneur. Thirdly, situations where subjective judgment is involved tends to invite the most conflict. Because there are no qualifications required to give a judgment. Everyone has an opinion and everyone is entitled to give it. There is also no way to prove or disprove anything, because a judgment is a judgment – there is no right or wrong. Reflect on your life today and you will easily observe the bike shed effect at work. For example, you worry too much about a simple purchase decision (like scenario above on choosing colors). You spend a lengthy amount of time along the aisles of the supermarket, pondering whether to buy whole wheat bread or multi-grain bread. You set up a new business and a lot of people try to tell you what you should do, but none of them have direct experience setting up successful businesses before. You stress out whether to go to Country A or Country B for your vacation (or even between choosing Hotel A or Hotel B. You argue with your partner on whether to leave the toilet seat up or down. You argue with your roommates on whether to have the heater on or off. In all of the scenarios above, the common problem is that there is too much noise in the system. Too many thoughts, too many opinions, too much energy expended, all over things that don’t even matter in the first place. They may seem important at first, but fast forward a week, month, year – they lose their significance. Hence you want to avoid the bike shed effect in your life – if possible, even prevent it. How can you do that? There is no need to follow to feedback / advice from everyone. 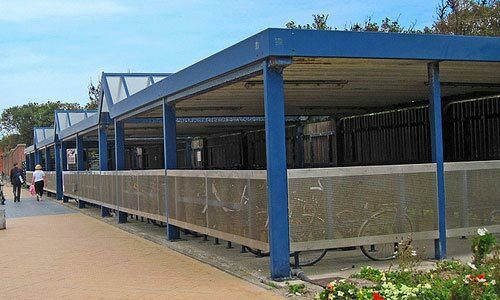 Everyone can give an opinion on what to do with your bike shed but the value of the opinion differs from person to person, depending on his/her knowledge and experience. Hear them out, listen to what they have to say, but you don’t need to follow what people tell you. Assess the source first and conclude if it’s a source you want to listen to. Day 19 of Be a Better Me in 30 Days Program on Seeking Advice gets you to approach at least 2 people (relevant to your goals) for valuable advice. Go for the color you want. In the bike shed story, everyone spends a lot of time debating over which color to choose for the shed. Reflecting onto your life, are there people telling you what color you should paint your bike shed? It’s nice to hear their opinions, but the bike shed is yours and you are going to be the one to live with it forever. What color do YOU want to paint YOUR bike shed? That’s something you have to ask yourself. Ask yourself how significant this is. Does the color of the bike shed really matter, honestly? Is this thing you’re pondering over even significant to begin with? Significant being: (a) Will it impact you 1, 3, 5 years from now? (b) Is it an irreversible change? (c) What’s at stake here, really? If it’s a “no” for (a) and (b), and if there is nothing major at stake, then it’s not all that significant and you shouldn’t be spending your energy on this in the first place. Use objective assessment tools. Assuming the problem is significant enough for you to spend further time on it, objectifying it may help with your decision making process. Since subjective judgment tends to be, well, subjective and hence inconclusive, use objective criteria to bring light to the situation.For example, if you’re considering whether to quit your job now or wait out for a few more months, objectify the problem: Identify your objectives, nail down the pros and cons of each option, then pick the one that fits your objectives the best. If you are not sure which location to set up your new restaurant, then do an analysis of the human traffic, cost, and potential returns for each location, and see which is more profitable. If you’re not sure which stock to buy for your investment, then evaluate the list of stocks, analyze their past trends, understand the performance of each company, then make your decision.Every situation, no matter how subjective it may seem, can be easily objectified when you pinpoint the criteria you are looking for. Don’t talk about something unless you are ready to hear others’ opinions about it. Everyone likes to comment on a bike shed scenario. Think about it as a can of worms that will get out of control once you open it. By talking about it, you are essentially issuing an open ticket for others to critique it. Naysayers tend to latch tightly to these opportunities to air their thoughts. So unless you are ready to listen to what others have to tell you, don’t talk about it at all. Use the 80/20 list to identify important tasks over unimportant bike shed problems. Many of us have a tendency to occupy ourselves with unimportant bike shed problems because they are easy and “painless”. However, they are also pointless and a waste of time.The 80/20 list is a high performance to-do list covered in Day 8 of Live a Better Life in 30 Days Program. Basically you segment your tasks into 2 piles: 20% high-impact tasks and 80% low-impact tasks. Then, you allocate a disproportionate amount of time to the 20% high-impact tasks and push back the 80% low-impact tasks – either by doing them quickly, delegating, outsourcing, or ditching them altogether. This way, you don’t let yourself get sucked into the unimportant bike shed problems. Pick one and go. If the decision doesn’t matter in the long run, then just pick any option and go. For you to even have a dilemma over the options – that means that they must be pretty good to begin with, aye? So, it’s not going to matter much whether it’s you pick the color green or yellow. Do you see the bike shed effect at work in your life? What kind of situations do you see it at work? How can you apply the 8 tips above?